When the owner first saw the hillside site of her future garden she knew the severe slope of the property presented a real design dilemma. Since her goal was to create areas of slow reveal inviting a walk, she knew it required terraces, paths, and spaces for resting during a climb to the top of the hillside. 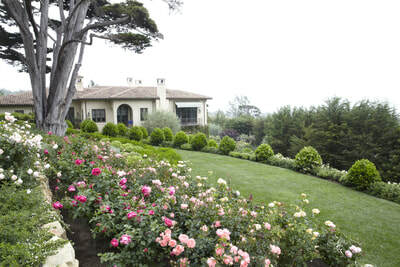 She also wanted to use roses as part of the landscape planting, and not just the typical formal beds. In addition, she wanted to have the garden visitor come upon different “hidden” spaces to sit and enjoy the view of the Pacific Ocean or examine at close range the enormous variety of plants used to enhance her collection of roses. When the owners bought the three-acre property in 2005 there was no garden on the property, only trees and lawn covering the sloping hillside. 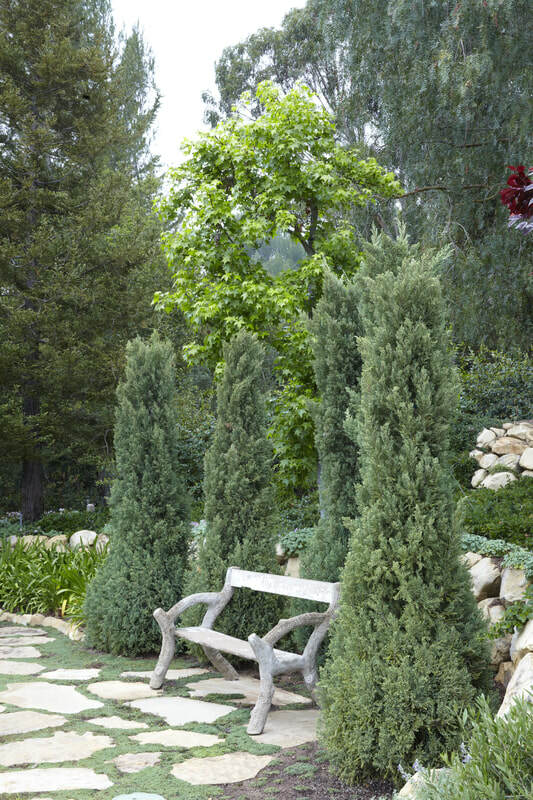 The cypress hedge at the back of the garden, some olives, oaks, eucalyptus, and arbutus, lawn and foundation plantings were the primary vegetation around and no one had attempted a true finished garden. Besides the visual effect of color and texture, there was a conscious effort to incorporate all the senses. 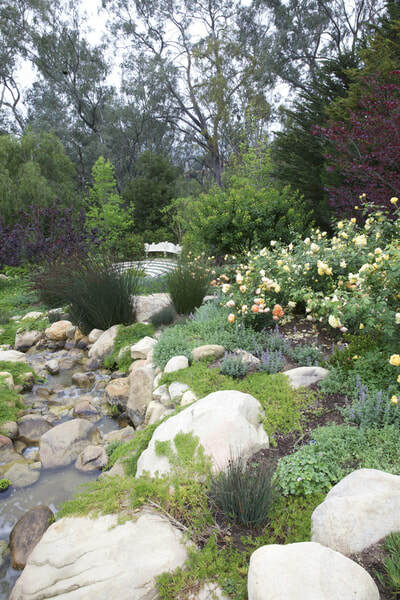 The sound of water and the fragrance were important elements in planning and plant palette. 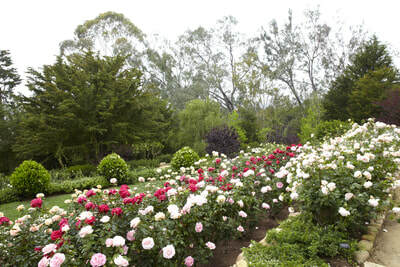 Many of the plants invite touch and even taste was considered as the family enjoys figs, avocadoes, and citrus at the northern end of the garden. 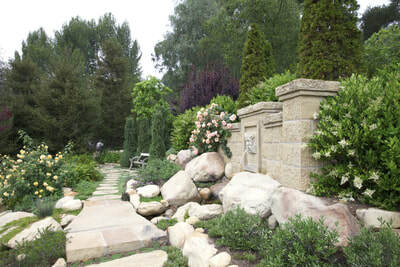 The addition of a man made stream using recirculating water, yet appearing as if it came from the mountains above the property, was an important decision made early on, and is a defining element of this hillside garden. Natural boulders and rocks found on the property were incorporated into the design and serve to contrast strongly with the delicacy of the roses and the formality of the design. Walking paths cross the meandering stream at irregular intervals creating a feeling of natural wildness in contrast to the linear formality seen elsewhere. 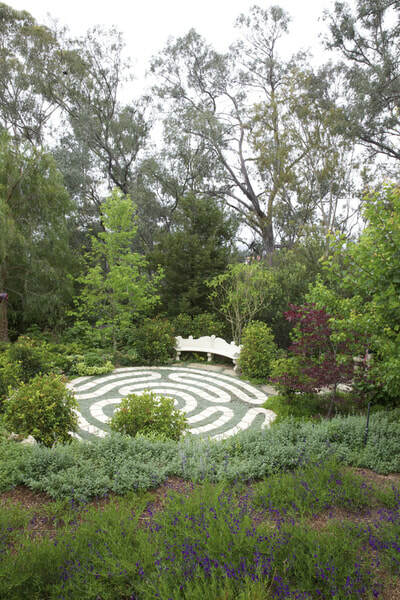 As the plan for the garden shaped up, a labyrinth at the bottom of the garden seemed appropriate and was added as a focal point. Many manmade garden accessories including unique benches, a pergola, a small fountain installed by the former owners, and the large fountain head at the top of the garden were tastefully and sparingly incorporated into the design to encourage the visitor to amble through the garden or find a pleasant place to rest during the visit. 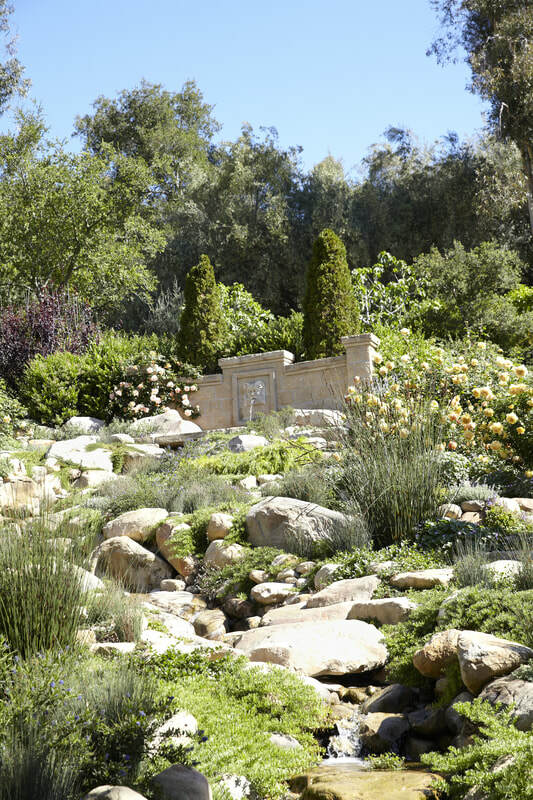 The owner had designed two other gardens in Southern California before this ambitious hillside was tackled. Being a garden enthusiast she had for years visited nurseries and gardens on a weekly basis, learning more and more about the plants that would do well in southern California. She was an avid garden tourist, exploring gardens wherever she and her husband traveled. 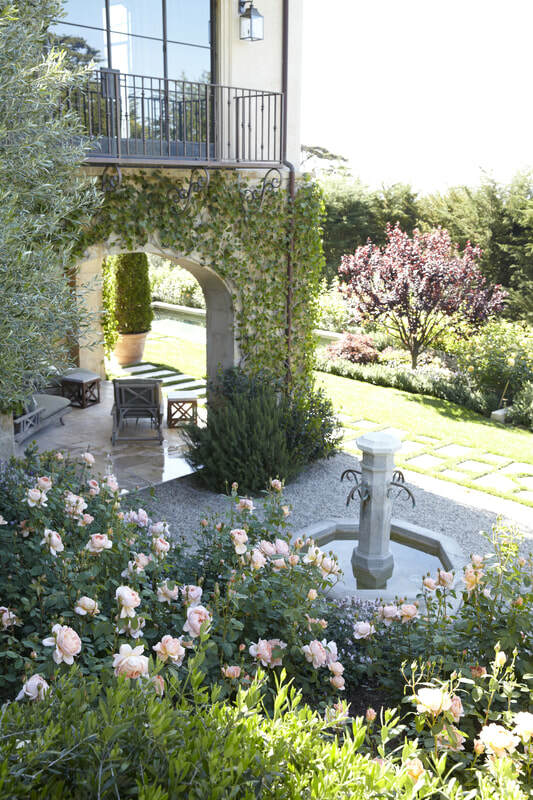 These gardens and particularly those in southern France inspired her own garden as did the Mediterranean style of their house with its numerous arches and curves. Jim Melnik was the local Santa Barbara landscape designer who helped the owner devise plans for the garden, design the stream of recirculating water and choose plants that would please even the most knowledgeable horticulturist as well as the neophyte gardener simply enjoying the beauty of the scene. A knowledgeable plantsman and landscape architect, Eric Nagelman also advised on the plant selection and Santa Barbara rosarian Dan Bifano helped with the selection of roses. 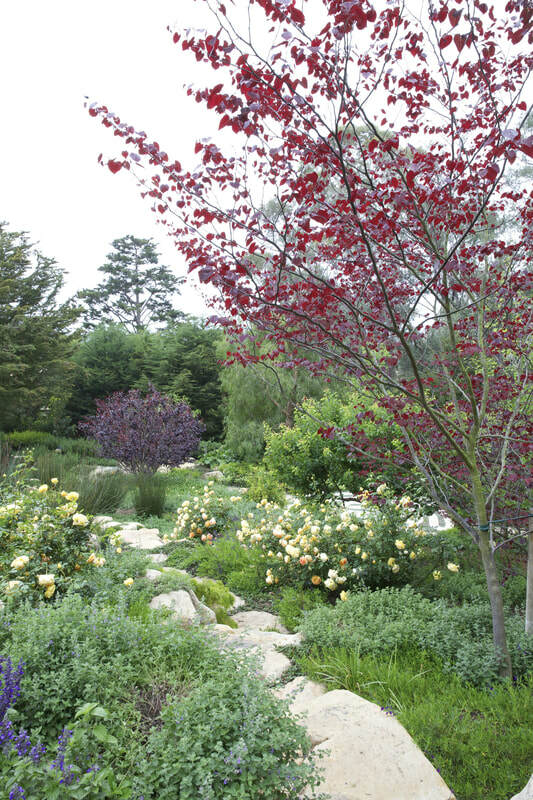 It took several years, and “trial plantings” to bring the garden to its present state. 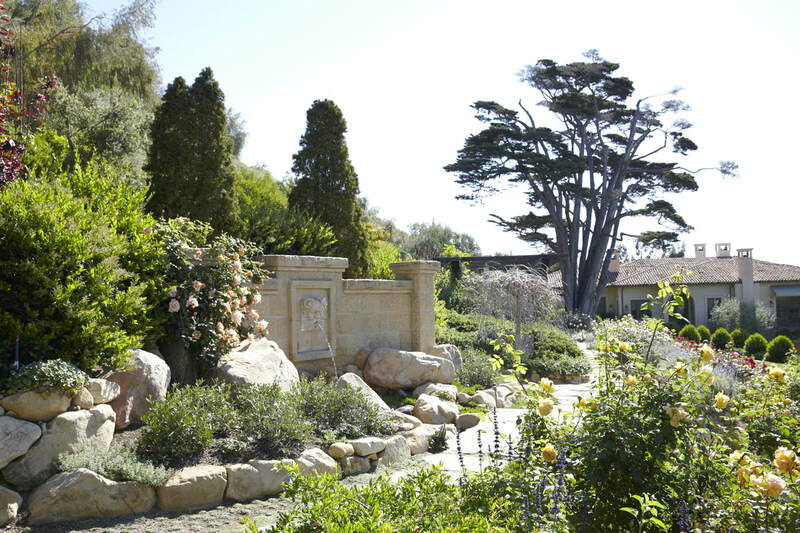 The garden has evolved into one that takes advantage of its magnificent site, combines the elements of a natural landscape with a cultivated European country garden style, and provides enjoyment for the numerous visitors who are generously invited in.